Where style and convenience meet! Owl View Landing - A brand new 40-unit condominium complex, conveniently located in North Kalispell. We've just completed construction on the first condo building and it is now available for rent, and the remaining four condo buildings will be completed soon. 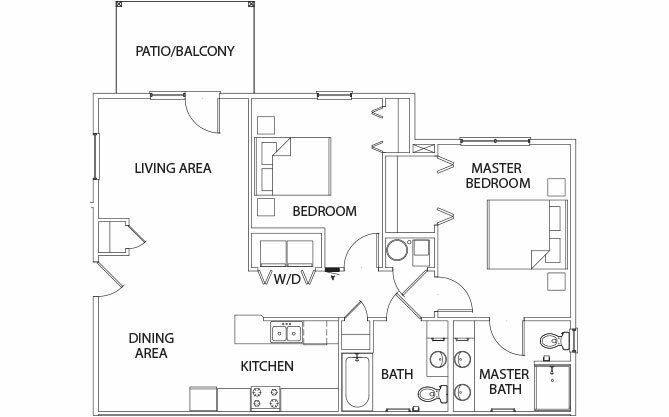 Choose from our two and three bedroom condos. 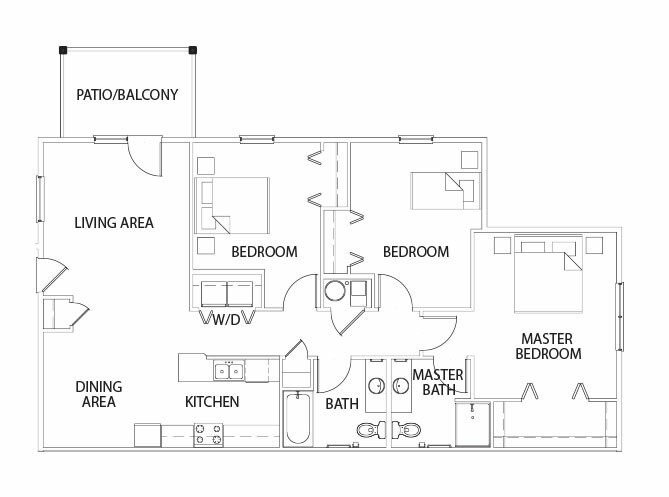 Every nest offers a generous floor plan, two bathrooms, energy efficient heating and cooling, and sophisticated transitional design that beautifully blends traditional elements with modern design principles. Features, such as easy-to-clean, durable, luxury vinyl plank flooring in the main living areas, soft and cushy carpet in the bedrooms, modern light fixtures, sleek, white, stain-resistant solid surface countertops, and quality alder wood cabinets with a low-sheen ginger finish, combine to provide a bright, warm and welcoming environment for you to call home. You can afford to dwell well! Apply today to give flight to your dreams. At Owl View Landing we've combined the wisdom achieved from years of home building, with a sharp eye for quality, skillful craftsmanship, and thoughtful design to offer a truly superior living experience...at an affordable price. 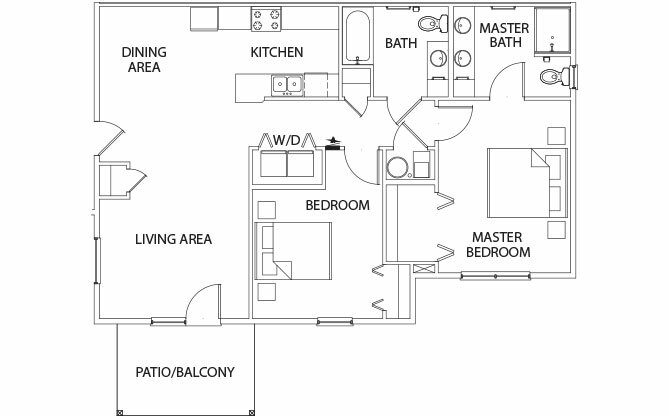 Our spacious two and three-bedroom nests, respectively, feature 1,120 and 1,360 square feet of living space: giving everyone room to spread their wings. Each floor plan provides two bathrooms, a patio or balcony, a washer and dryer, quality appliances including an over-the-range or countertop microwave, ample closet space, and modern transitional design finishes. Owl View Landing offers an unbeatable location in North Kalispell, just off Old Reserve Drive, near access to the Highway 93 bypass. With nearby amenities, such as shopping, dining, entertainment, excellent schools, and the medical district, you won't be flying far from your nest to access the services you need. When you live at Owl View Landing, you can kiss those time-consuming trips across town goodbye. Conveniently located just 17 minutes from Whitefish, 24 minutes from Columbia Falls, and only 29 minutes to Bigfork, so you can quickly travel anywhere you need to go with ease. Located within the established West View Estates neighborhood, Owl View Landing offers a quiet, laid-back, quality community you'll be proud to call home. While we may be near to the heart of Kalispell, you won't realize it while you're relaxing at home in this peaceful neighborhood. Easy urban access with mountain and country views! Whether you rent one of our second level treetop nests or a ground-level burrow nest, you'll have excellent views of the surrounding countryside, and the Flathead Valley's signature mountainscapes. With our tenant portal, you have easy access to lease information, online payments, payment history, messages, and important documents. Submitting a maintenance request should be simple. Our tenants can submit maintenance requests online 24/7 - 365 days a year. We believe paying your rent should be easy. That's why we provide our residents with options. Pay online via ACH or credit card, or pay by mail. Why Aren't You Getting More Bang for Your Buck? It's time for you to trade-up your old tired apartment, for a younger, fresher condo. Hoo? You, of course! Well...what are you waiting for? 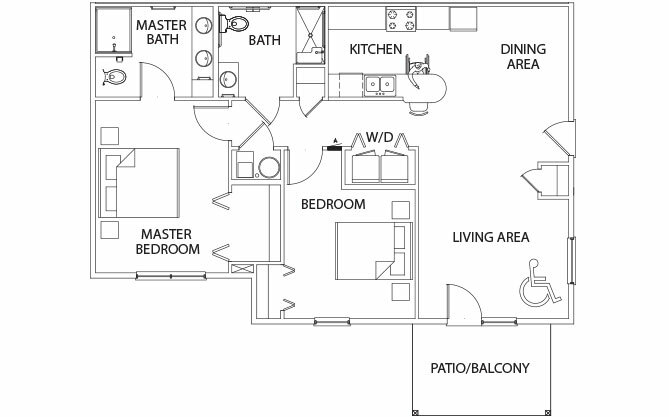 Apply today to rent one of our two or three-bedroom nests. The condos at Owl View Landing were thoughtfully designed to create fluidity and ease of living throughout the home because we believe that your lifestyle deserves an upgrade. Entering through your new front door, the first thing you'll notice is a generous open-concept living room, kitchen, and dining area featuring durable luxury vinyl plank flooring that is easy to clean, and will look amazing for years and years to come. We understand that having storage space is essential, so, to make sure you have room for storing your shoes and coats, we included a closet just inside the entryway. To the right of the front door, you'll find a comfortable dining area with room for a table and chairs. Toward the rear of the dining area, you'll discover a well-appointed kitchen with white, solid surface countertops, alder wood cabinets with a low sheen ginger finish, quality appliances, and a built-in microwave. Opposite the dining area is a large living room, with a door on the far wall that opens out to your new patio or balcony, so that in addition to indoor comforts, you can enjoy outdoor living space, as well. As you continue moving through the condo and begin heading down the hallway, immediately to your left, you'll find the laundry closet, with top-loading washer and dryer included. Adjacent to the laundry, you'll encounter the second bedroom which features quality carpeting and a standard-size closet. Back out in the hallway, directly across from the second bedroom, you'll find the second bathroom and another storage closet. The utility room is positioned just across the hall from the bathroom, and the master bedroom lies at the end of the hallway. A large master bedroom lends room for a king-size bed and features inviting carpeting, a large walk-in closet, and an en-suite bathroom with dual vanity. When you enter in through your new front door, you'll notice a large open-concept living room, kitchen, and dining area. The floors in these rooms are done in a stunning luxury vinyl plank flooring that is durable and easy to clean, ensuring your home will look amazing for years to come. We also wanted to make sure that you have room to store your personal effects, so, we included a closet just inside the entryway. To the left of your front door, you'll find a comfortable dining area, with plenty of room for a table and chairs. Toward the rear of the dining room, you'll discover a well-appointed kitchen with white, solid surface countertops, alder wood cabinets with a low sheen ginger finish, quality appliances, and a built-in microwave. Across from the dining area, is a large living room, with a door on the far wall that opens out to your new patio or balcony, so that you can dine alfresco. As you continue moving through the home, and head down the hallway, immediately to your right you'll find the laundry closet, complete with a top-load washer and dryer. Next-door to the laundry closet, you'll find the door to the second bedroom, which features handsome carpeting and a standard-size closet. Back in the hallway, directly across from bedroom number two, you'll find the second bathroom and another storage closet. The utility closet is located across the hall from the bathroom, and the master bedroom lies just at the end of the hall. The master bedroom allows ample room for a king-size bed and features thick carpeting, a large walk-in closet, and an en-suite bathroom with dual vanity. As you come through your new front door, the first thing you'll notice is a roomy open-concept living room, kitchen and dining area, boasting durable, easy-to-clean luxury vinyl plank flooring that will look amazing for years and years to come. To make sure you have room for storing your belongings, we've included closet space just inside the entryway. To the left of the entry is a spacious dining area with room for a table and chairs. At the rear of the dining area, you'll find a well-equipped kitchen with smooth, white, solid surface countertops, alder wood cabinets with a low sheen ginger finish, quality appliances, and a built-in over the range microwave. Juxtaposed to the dining area, is a large living room, with a door on the far wall that opens out to your new patio or balcony. As you continue through the condo and begin moving down the hallway, immediately to your right you'll find the laundry closet, with top-loading washer and dryer included. The first bedroom is located next to the laundry room and features plush carpet and a standard-size closet. Back in the hallway, just past the first bedroom, on the righthand side, you'll find two more doors. The first door is for the utility closet, and the second door leads to the second bedroom. Opposite the hall from the first and second bedrooms, you'll notice a bathroom and another storage closet. The master bedroom lies just at the end of the hall. The master bedroom affords room for a king-size bed and features beige carpeting, a large walk-in closet, and an en-suite bathroom with a single sink vanity. Enter in through your new front door, and the first thing you'll notice is a spacious open-concept living room, kitchen, and dining area, all featuring durable luxury vinyl plank flooring that is easy-to-clean and will look amazing for years and years to come. To make sure you have room for storing your shoes and coats, we've included closet space just inside the entryway. To the right of your front door, is the dining area with room for a table and chairs. At the rear of the dining area, you'll find a fully-appointed kitchen with solid surface LivingStone Snowfall countertops, alder wood cabinets with a low sheen ginger finish, quality appliances, and an over the range built-in microwave. Counter to the dining area, is a spacious living room, with a door on the far wall that opens out to your new patio or balcony. As you continue moving through the condo and begin heading down the hallway, immediately to your left, you'll find the laundry closet, which comes complete with top-load washer and dryer. Next door to the laundry room, you'll notice the first bedroom, which features quality carpet and a standard-size closet. Back in the hallway, just past the first bedroom, on the left-hand side, you'll find two more doors. The first door is for the utility closet, and the second door leads to the second bedroom. Directly across from the first and second bedrooms, you'll find a bathroom and another storage closet. The master bedroom lies just at the end of the hall. The master bedroom delivers room for a king-size bed and features alluring carpet, a large walk-in closet, and an en-suite bathroom with a single sink vanity. Entering through your new front door, the first thing you'll notice is an ample open-concept living room, kitchen and dining area featuring durable, easy-to-clean luxury vinyl plank flooring that will look amazing for years and years to come. To make sure you have room for storing your personal effects, we've included closet space just inside the entryway. To the right of your front door, is the dining area with room for a table and chairs. Just off the rear of the dining area, you'll find a well-equipped kitchen, with white, solid surface countertops, alder wood cabinets with a low sheen ginger finish, quality appliances, and a countertop microwave. This unit also features a range with the control panel located on the front panel and toe-space beneath, as well as knee space under the kitchen sink. To the left of the entry, is a large living room, with a door on the far wall that swings opens to your new patio. Heading out of the living area, as you move down the hallway, immediately to your left you'll find the laundry closet, which includes a front loading washer and dryer. By the laundry room, you'll notice the door to the second bedroom, which features quality carpeting and a standard-size closet. Back in the hallway, directly across from bedroom number two, you'll find the second bathroom and another storage closet. 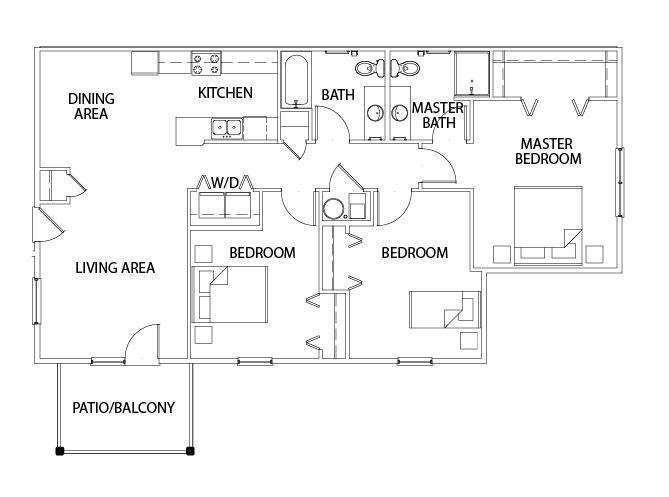 A utility closet is located across the hall from the bathroom, and the master bedroom lies just at the end of the hall. The master bedroom affords room for a king-size bed and features beautiful carpeting, a large closet, and an en-suite bathroom with dual vanity and knee space below, and a barrier-free shower. Enter in through your new front door, and the first thing you'll notice is a sizeable open-concept dining room, kitchen, and living area featuring durable, easy-to-clean, luxury vinyl plank flooring that will look amazing for years and years to come. To make sure you have room for storing your belongings, we've included closet space just inside the entryway. To the left of your front door, is the dining area with room for a table and chairs. Off the rear of the dining area, you'll find a well-appointed kitchen, with sleek, solid surface white countertops, alder wood cabinets with a low sheen ginger finish, quality appliances, and a countertop microwave. This unit also features a range with the control panel located on the front and toe space beneath, as well as knee space under the kitchen sink. To the right of the entry, is a large living room, with a door on the far wall that swings opens to your new patio. Moving out of the living room, as you begin moving down the hallway, immediately to your right you'll find the laundry closet with a front-loading washer and dryer included. Just over from the laundry room, you'll notice a carpeted bedroom, that features a standard size closet. Back in the hallway, just past the first bedroom, on the right-hand side, you'll find two more doors. The first door is to the utility closet, and the second door leads to a second bedroom, which features the same appointments as the first bedroom. Directly across the hall from the first and second bedrooms, you'll find the second bathroom which features knee space beneath the sink, and a barrier-free shower. Next door to the bathroom, we've provided another closet for additional storage space. The master bedroom lies just at the end of the hall and includes room for a king-size bed. 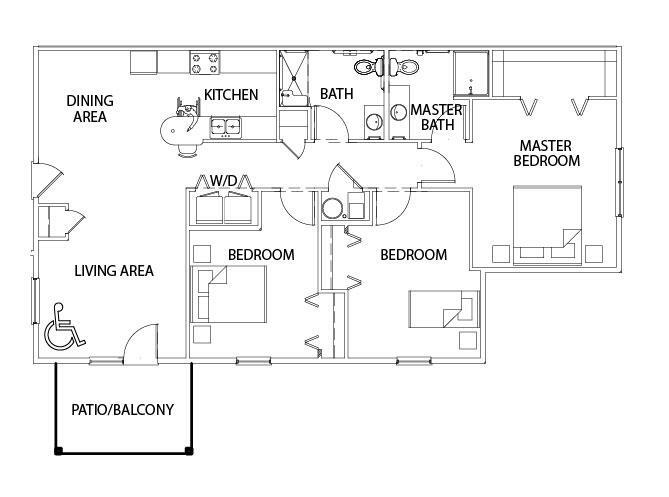 The master features quality carpeting, a large closet, and an en-suite bathroom with a single sink vanity with knee space below, and a barrier-free shower.